People that know me well, know that i am a voracious reader. Maybe even to the point of it being a “problem” at times because I get so captivated by a book that it if I’m not really careful, it can take more of my time than I should allow it to. Now for those who assume that being in ministry, all of my books are theological in content, you’d be mistaken. Most are (because that’s what I enjoy most) but I also read a good deal of secular works, biographies and occaisionally….all right…very occaisionally fiction. That being said, those who know that I read a ton often ask what book I would most recommend to them (outside of the Bible, of course. which is FAR more than a mere book). That can be a huge question. And the gravity of it is magnified even further by the fact that I take literature and its infuential power extraordinarily seriously. I’ve wrapped myself up in some wonderfully good works over the years. I’ve gleaned from countless authors, awesome insight and have pulled beneficial principles from the ink off of scores of pages and have applied them to my thinking, my actions, well…my life. So asking, “Other than the Bible itself…what ONE book would you recommend that I read?” should be a very difficult question. Surprisingly, I can answer it without hesitation. Now, if the question were, “Give my your top five books?”, it gets a lot tougher (I’ve got that list but it seems to change…often). Even “Whats the top 3?” proves horribly mind boggling to me because there are so many great books out there. But the whole “Other than the Bible itself, give me your top recommendation?”….piece of cake. Again, other than Scripture itself (which every work, regardless of its beauty and storyline, pales in comparison to)…There is one book that, for me (better said “us”), stands head and shoulders over everything I’ve read. I’ve learned through it. I’ve taught from it. I’ve been convicted and encouraged through it. My entire family has benefitted from it and I can honestly say that I am a better man for reading it…. 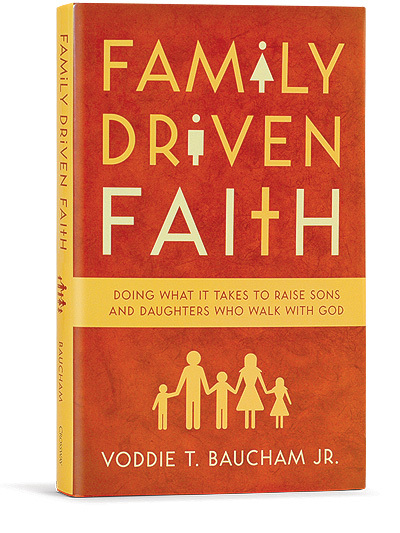 “Family Driven Faith: Doing What It Takes To Raise Sons & daughters Who Walk With God” – Dr. Voddie T. Bauchum Jr.
About The Book- The research is in…and it is alarming. We can no longer excuse it, we can no longer sweep it under the rug. Today, more teens are turning away from the Faith than ever before. Recent research estimate that as many as 88% of teens who profess Christianity walk away from their faith by the end of their freshmen year in college. This is OUR youth group in a few years folks. This is OUR sons and daughters. In “Family Driven Faith” Dr. Bauchum, who writes with both a Pastors and a Parents heart, teaches why this is happening and how to stop the bleeding. In the pages of this book, you will find tools to assist the Christian parent in raising Biblically faithful children in a post-christian, anti-family society. Through Gods grace, Dr. Bauchum and his wife overcame a multi-generational legacy of broken and dysfunctional homes and his writing and testimony encourages us in the fact that God has not left us alone in raising Godly children. You’ll find timeless precepts and principles for multi-generational faithfulness in this book (most of which were pulled from my favorite passage in the Bible concerning the home, Deuteronomy 6). This book is in my opinion as a Pastor and parent, the most timely, urgent and dare I say essential read for parents, grandparents and one day parents (it’s required reading for my pre-marital counseling classes) of the day. It’s a trumpet sound of warning concerning what is happening right now with our children and a Scripture saturated instruction manual on returning to the Biblical model of discipleship through the home. Criticisms of the Book– I do not have a single one. Only a warning, it packs a punch. I could go on and on with people who hold this book in the highest regard. I could also go on and on with people who do not. Dr. Bauchum Scripturally challenges the status quo and modern methodologies and that is frowned upon by many and they are entitled to their opinion on the matter. As for me and my house, we say read it. Buy it as a Christmas gift for adult sons and daughters, friends or for a young couple in your church. It will bless them as it has my family and I! You can also get it at your Local Lifeway and I assume most Christian bookstores.